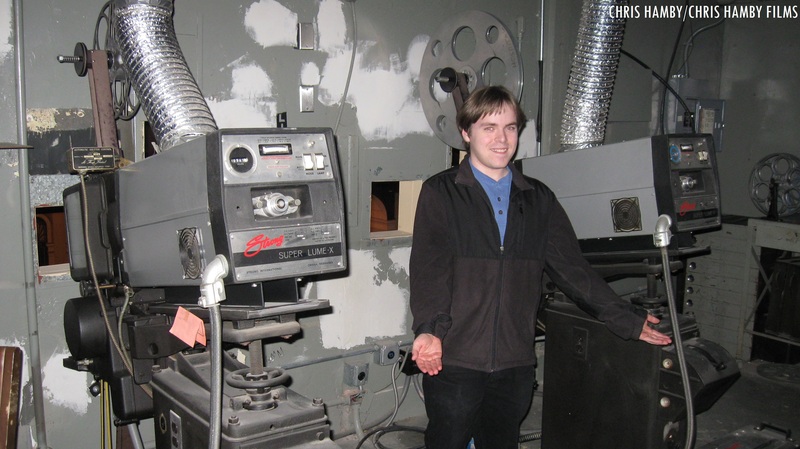 Chris Hamby, standing next to two vintage Simplex X-L projectors at the Weinberg Center for the Arts (the former Tivoli Cinema) in Frederick, Maryland. “Silver Screen Reflections,” an offshoot blog of “At the Matinee,” is dedicated to interesting facts on classic, contemporary and cult films. Both sites are maintained by Chris Hamby, a local freelance filmmaker and classic film enthusiast who attends Hood College in Frederick, Maryland. This blog will not only be limited to television and film in general; it will also focus on local film events, including the 72 Hour Film Festival, Hood College’s “Blockbuster Movie” events, and similar film screenings in the region. Upcoming showings of classic, contemporary and cult motion pictures on television will also be showcased as well. “Silver Screen Reflections” will also focus on the latest in screen multimedia technology, physical media (DVD-Video & Blu-Ray discs) and the rise of streaming video services. This blog welcomes all comments (related to cult, classic and contemporary films) from fellow film fans and enthusiasts. Engage in discussion (and conversation) about classic/cult motion pictures! “Don’t ignore good entertainment.” See you at the matinee!